Here is an alternate version of a tall tree with bigger stem. Edit: And an alternate version of a tall tree with a smaller crown. Nice! I edited it a little bit. EDIT: I moved the leafs and trunk a bit so that they fit the grid better. The small version of the tree looks a lot like the Alttp tree, which is awesome! I started humming the ALttP Dark World theme upon seeing those trees, before reading the text! Nicely done, Brad and Rayo! Now you just need a white palette or snow-covered treetops and you'd have some assets for making all four seasons represented! Here is another small edit. I changed the size of the crown again for small tree. Pine tree still looks a bit weird with that stem. Actually you have something here with these ledges and rocks. you should expand on it, make it for every overworld area in minish cap. These trees are made to be put in clusters, you can see that in the map below as an example. 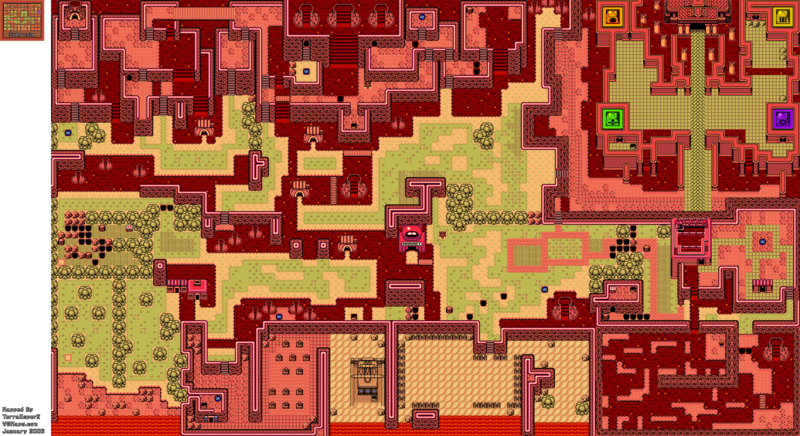 So I continued with the ALTTP map, changing the cliffs and trees, and I think it looks way better. What are your thoughts on this? There is still a lot of work to do and tiles to change. Ohh those houses and roofs. tried making my own ended up as awful recolor. how do you expand on the house and roof tilesets? So I made The hero´s shade in MC style. I think it looks quite good. Its a bit dark, but that´s how it was in TP, and I did use the MC palette, I looked for colors that were as close to the original. I think I pullet if off. Not too sure about the side view though. You think you can do lana from Hyrule warriors? i think i remember seeing a volga on this site somewhere but i cant find it. I guess I can give lana a shot, volga was in Leduardo´s sprite thread. 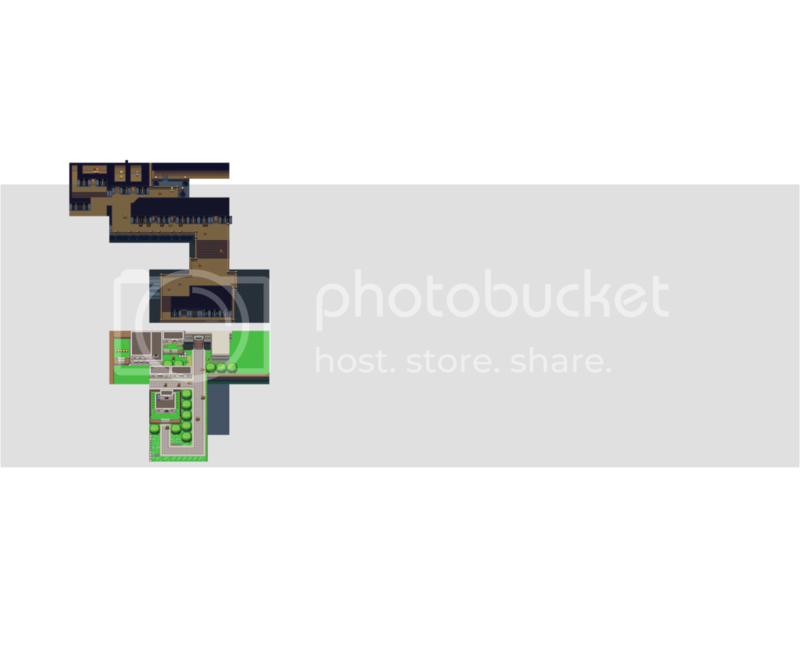 Well it seems photobucket changed the rules for its uploads..great. Also i was searching on google for zelda like tiles to use when i came across yours for the king of thieves thing. those tiles of yours areonly for the game or are they free to use? It will probably look better if you fuse your sprite with this Skyward Sword Bokoblin. Anyway, I think you can make the Bokoblin a little bit bigger, if you look at the screenshots and art of it you can see that his body is kinda shaped like a pear. You can also see that he got a more hunching pose with his legs far apart kinda like a sumo stance. You ever thought about adding slopes an such to the mc cliff tiles like the ones in this http://www.vgmaps.com/Atlas/GB-GBC/LegendOfZelda-OracleOfSeasons-Subrosia.png basically front facing slopes for the top of the cliffs and let them be able to merge seamlessly with your cliff tiles. Not sure what you mean exactly. Could you circle the cliff areas you are reffering to? I expanded upon the small crystal and made small barriers, though I cannot decide whether to keep the rounded sides or the more square ones. What do you guys think of this? Should I expand into crystal cliffs and more stuff? Page created in 0.08 seconds with 69 queries.